Recently I found that no programs were scheduled for recording on my Media PC. This is pretty much unheard of in my household so this started ringing some alarm bells. With some debugging I found that the television guide was not updating correctly for my over antenna signals. The issue was easy to see when opening the guide which looked a lot like the screenshot below. 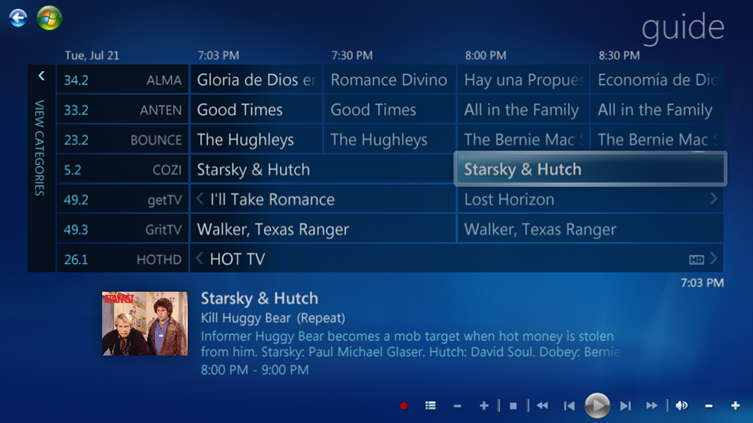 From this article (http://www.thedigitalmediazone.com/2015/07/08/microsoft-breathes-new-life-into-media-center-guide/) we can see that Electronic Program Guide (EPG) data was converted from Zap2It to Rovi. 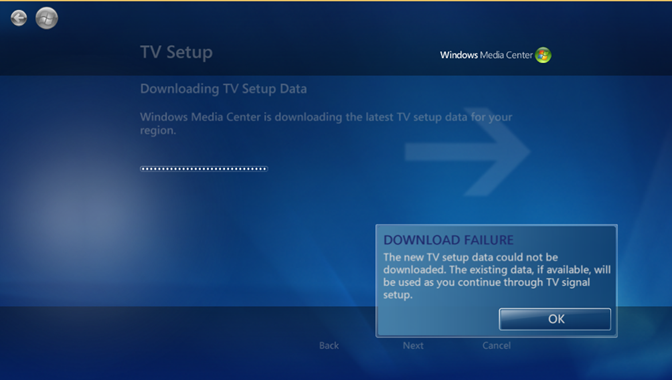 This conversion appears to have been the cause of having no television guide information available in Windows Media Center after July 20th 2015 for several zip codes (at least). I recommend avoiding the tasks above if you media center system is currently working but is just missing the guide data. 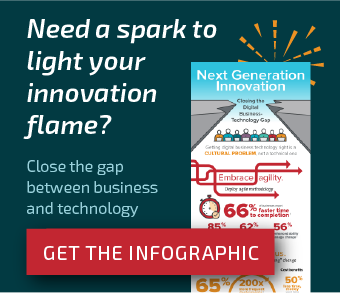 I found an existing discussion on this topic at https://connect.microsoft.com/site1145/Feedback/Details/1573972. From discussions on this thread and recommendations from ewtaylo1 (huge thanks!) I was able to put together a workaround which works for my system and from feedback I’ve received in twitter it appears to be working on other systems. This blog post will provide the steps that I used for this workaround and suggestions for this issue going forward. 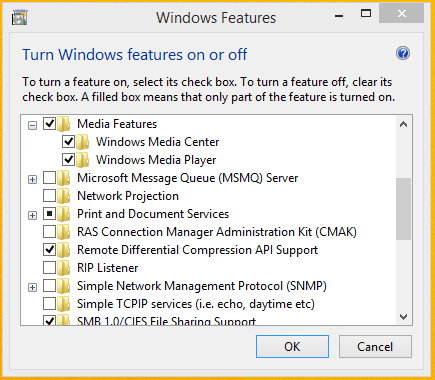 Remove the media center feature (note, this is only required if you cannot successfully re-run the TV tuner setup in Windows Media Center) and reboot system. Re-add the media center feature. Re-run the tv tuner setup – trying other local zip codes. 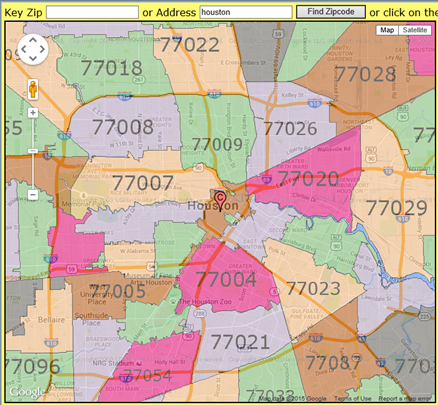 The key on this was to start with the closest ones to your existing zip code and radiating outward (see http://zipmap.net/Texas.htm for an example of a website which shows this type of information). Since this is a guide for over the area transmissions, zip codes which are close by should be sufficient. A failure to get data for the zip code you entered will show up with an error like the one shown below. Do not continue past this step, go back and try another local zip code. To determine if the zip code you entered is working refer to the underlying log file available in c:\programdata\microsoft\ehome\logs\FirstRun.log. 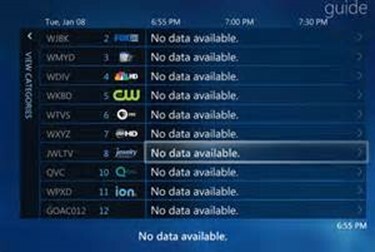 Once I found a working zip code the media center application continued with TV signal detection. 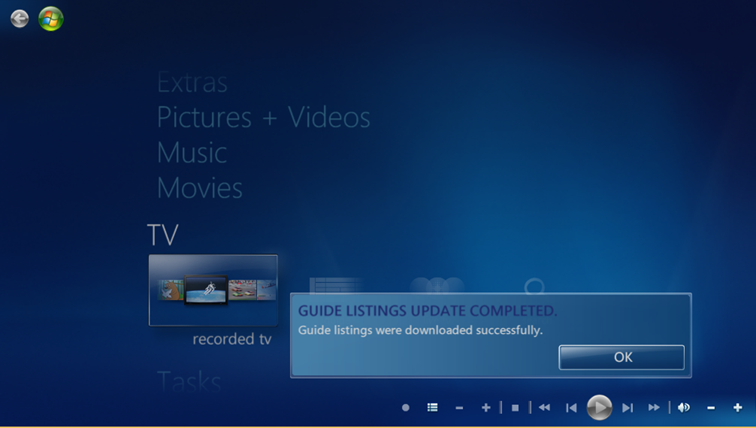 After completing the setup the guide listings message indicating a successful update appeared a few minutes later. A successful update to the guide was able to be show that the data was successfully being gathered from Rovi as shown below. And a successfully populated guide is the final step in validating that the new guide is now functioning correctly. Summary: In my environment I was able to work around the issue by trying a variety of local zip codes until one of them would populate the television guide data correctly. Suggestions: For Microsoft on this issue going forward it’s critical to the user community that the guide data is available for all locations. In the interim, having a list of acceptable zip codes would be a huge assistance for other people in the community who are running into this issue. – Click Start > All Programs > Accessories. -Right-click Notepad and select Run as administrator. -Click Continue on the Windows needs your permission UAC window. -When Notepad opens, click File > Open. -In the File name field, type C:\Windows\System32\Drivers\etc\hosts. -Click File > Save to save your changes. -Select Accessories and locate the Command Prompt shortcut. -Right click the Command Prompt shortcut and select Run as Administrator from the drop down menu. -Type ipconfig /release in the command prompt. -Wait a few seconds for a reply that the IP address has been released. -Type ipconfig /renew in the command prompt. -Wait a few seconds for a reply that the IP address has been re-established. -Type ipconfig /flushdns in the command prompt. 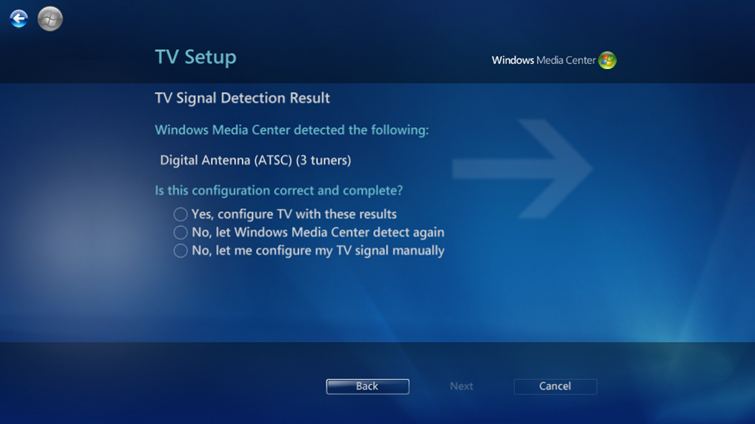 Last step is to run “Set Up TV Signal” from the WMC settings menu. After running the set up it should take 3-5 mins for the guide to update. UPDATE: 8/14/2015: Microsoft is working on the problem. Discussion on and feedback is available at: https://connect.microsoft.com/site1145/Feedback (this information came from http://www.thegreenbutton.tv/forums/viewtopic.php?f=30&t=8983). 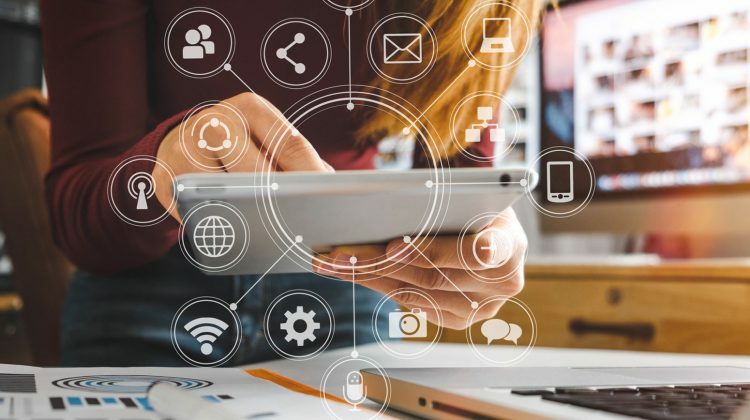 “As you may have guessed, there are a lot of people reporting issues on the Connect site – so many, we’re unable to respond to each of them individually. I want to assure you all that we are working on those issues, however. Daily, we are gathering all the issues reported, collating them by issue type, and following up on them as a group. 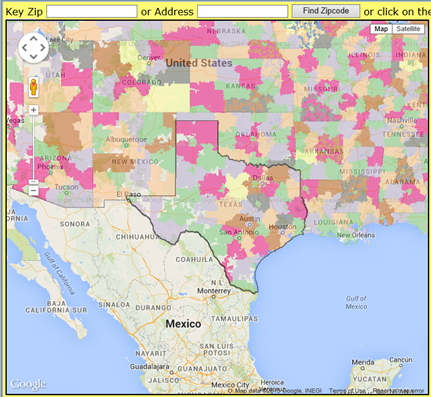 We look at each issue report of missing data for specific zip codes and providers to clean up the data feeds. So far, we have resolved a large number of data quality issues, addressed the series recording issues (if not, let us know! ), and are working on the cable card issues currently. UPDATE: 3/13/2016: Guide expiring on 3/19/2016? 3/15/2016 update: I am seeing a thread indicating that this should be fixed either 3/15 or 3/16. I am also on a discussion with Rovi on this via Twitter. 3/16/2016 update: I have received reports that the guide is now updating correctly and in my environment it now has program data until the 29th so this issue appears to be resolved now. 1) This does appear to be happening again to multiple systems as multiple people have reported this in their comments and I am seeing it as well. I will update with any resolutions that I find here. If you are having this issue as well, please log it to the following URL if you can get to the site: https://connect.microsoft.com/site1145/Feedback/Details/2452803. I have also sent a message to Rovi via their twitter handle and am waiting for a reply. 3/29/2016: The guide is now updating correctly to 4/11/2016.